Succinct arguments of knowledge are computationally-sound proofs of knowledge for NP where the verifier’s running time is independent of the time complexity of the NP nondeterministic machine for the considered language. 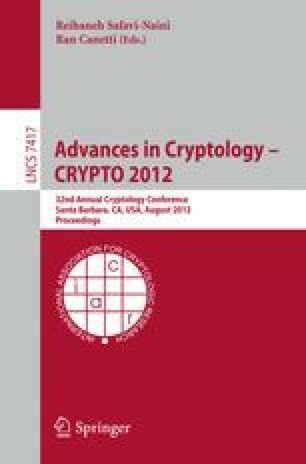 Existing succinct argument constructions are, typically, based on techniques that combine cryptographic hashing and probabilistically-checkable proofs (PCPs), and thus, in light of today’s state-of-the-art PCP technology, are quite inefficient: either one uses long PCP proofs with lots of redundancy to make the verifier fast but at the cost of making the prover slow, or one uses short PCP proofs to make the prover fast but at the cost of making the verifier slow. (1) We construct a one-round succinct MIP of knowledge protocol where (i) each prover is highly efficient in terms of time AND space, and ALSO (ii) the verifier is highly efficient. (2) We show how to transform any one round MIP protocol to a succinct four-message argument (with a single prover), while preserving the time and space efficiency of the original MIP protocol. As a main tool for this transformation, we construct a succinct multi-function commitment that (a) allows the sender to commit to a vector of functions in time and space complexity that are essentially the same as those needed for a single evaluation of the functions, and (b) ensures that the receiver’s running time is essentially independent of the function. The scheme is based on fully-homomorphic encryption (and no additional assumptions are needed for our succinct argument). (3) In addition, we revisit the problem of non-interactive succinct arguments of knowledge (SNARKs), where known impossibilities rule out solutions based on black-box reductions to standard assumptions. We formulate a natural (though non-standard) variant of homomorphic encryption that has a homomorphism-extraction property. We then show that his primitive essentially allows to “squash” our interactive protocol, while again preserving time and space efficiency. We further show that this variant is, in fact, implied by the existence of SNARKs.